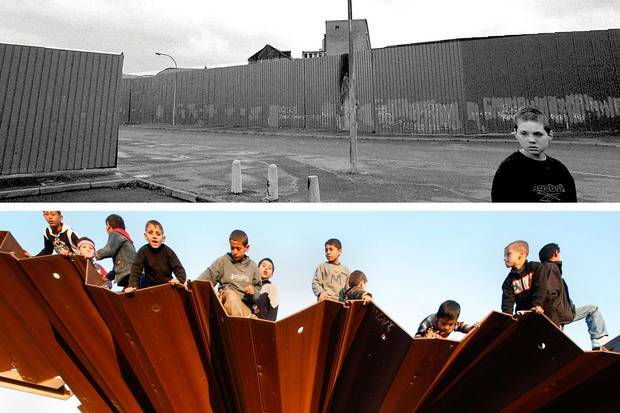 April, 2000 (top): Sean, a 11-year-old Catholic, walks out of his West Belfast home into a no-man’s land between two peace walls that separate him from Protestants. Jan. 25, 2008 (bottom): Palestinians sit on a destroyed section of the border wall in Rafah, southern Gaza Strip, on the border with Egypt. As a young man I spent time in Belfast studying its notorious walls. The Northern Irish city, then the epicentre of a nasty and protracted civil disturbance, had erected some 18 barriers between warring Catholic and Protestant neighbourhoods. Called "peace walls," these mostly steel or brick divides crossed roads, parks, housing estates, and even backyards. 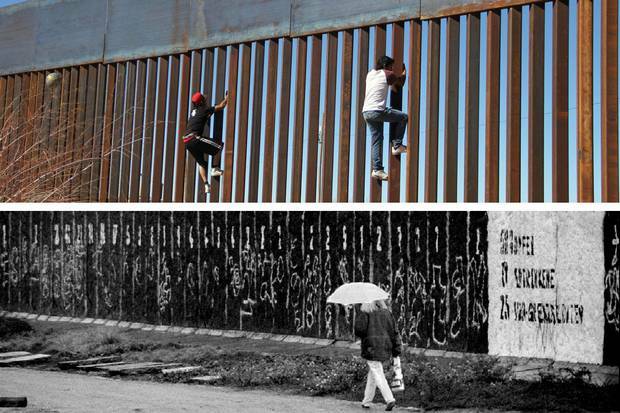 Jan. 26, 2017 (top): Boys play around, climbing the border division between Mexico and the United States in Ciudad Juarez. Nov. 8, 1993 (bottom): A woman walks along wall segments on the former death strip in central Berlin near the Reichstag. But the trend has actually been years in the making. Even as the Berlin Wall was dismantled in 1990, another 16 large-scale fence-barriers remain standing along national borders. By 2015, some 65 countries, ranging from Israel to Morocco to Hungary to Spain, had either built, or were busy building, them – nearly a third of the world's nations. He didn't, and the remainder of the century was mostly a happy news story. By the turn of the millennium, more than 120 countries were practising a variation on democracy. More nations than ever before were adhering to the rule of law, including the protection of individual and collective rights. They were, in that sense, open to being open, albeit with lots of caveats about extenuating internal circumstances. But according to Freedom House, the NGO that researches political freedoms and human rights, we are now in a protracted backslide of those same liberties, with 2016 marking the 11th consecutive year of setbacks in global freedoms. An essay accompanying the Washington-based organization's latest report begins with this forceful sentence: "In 2016 populist and nationalist political forces made astonishing gains in democratic states, while authoritarian powers engaged in brazen acts of aggression, and grave atrocities went unanswered in war zones across two continents." This apparent loss of confidence in liberal democracy is particularly bad news for immigrants, both those dwelling within such democracies and those seeking to escape authoritarian states. They are being recast as security risks and fifth-columnists, problems that go away by keeping doors judiciously closed. Populism has a lurid vocabulary for demonizing the most vulnerable. Hungarian Prime Minister Viktor Orban has called migrants "poison." Candidate Trump spoke of Mexican "rapists and criminals." Jan. 26, 2017 (top): Urban fencing on the U.S. border in Tecate, northwestern Mexico. Sept. 14, 2005 (bottom): Palestinians crowd at a gap in the border wall as they cross between the Rafah Refugee Camp, in the southern Gaza Strip, and Egypt. A handful of political leaders recognize this, and are mounting counterarguments. "Diversity is our strength," Prime Minister Justin Trudeau tweeted after the Trump administration's first attempt at a travel ban on Muslims. During his successful run for the French presidency, Emmanuel Macron thanked German Chancellor Angela Merkel for saving "our collective dignity" with her open-door refugee policy. For people on the outside of power, social, economic and political barriers aren't invisible, and never have been. The walls have been right before their eyes for as long as they, or their ancestors, can remember. For those on the inside, meanwhile, such critiques can sound strident and totalizing, a threat to supposedly communal values, even to a way of life. They don't see those structural barriers – or they just don't care. They also counterpunch. Proud Boys, believing their Canada to be under siege, attack an Indigenous demonstration in Halifax over the statue of Cornwallis. In a tweet, President Trump cites the "medical costs and disruption that transgender [sic] in the military would entail" as one reason to reinstitute the ban against their serving openly in the U.S. armed forces. He also mentions unspecified threats to "cohesion." The President is right about the disruption, if nothing else. Of late, noisy, public challenges have been garnering most of the attention. Black Lives Matter disrupts the 2016 Pride parade to address "anti-blackness" within the Pride Toronto organization. A ceremonial teepee is erected on Parliament Hill during Canada 150 celebrations as a symbol of unresolved grievances. The truest conversions are always the self-willed, and, thanks in part to the forceful thinking of these various groups, individuals of good will are slowly, steadily wanting to re-examine a list of assumptions and make right a list of wrongs. Our parents didn't teach us particularly well about some things. Nor did our history books. We sure don't always see the walls we live behind, and help reinforce. This is a profound project, and it is unfolding in messy real time. For sure, there is a lot of new thinking for a lot of us to absorb. But I can't imagine a more necessary or essential conversation. Necessary for its own sake, and essential for the health of liberal democracies, which count on engagement and introspection from their citizens to thrive. The principal challenge for now may be to come up with a working definition of real inclusion, one that is widely agreed upon, and that can become shared ground worth defending. That, too, probably can't happen easily or comfortably. We're still identifying the correct terms and appropriate players to do the work. This conversation is just beginning. 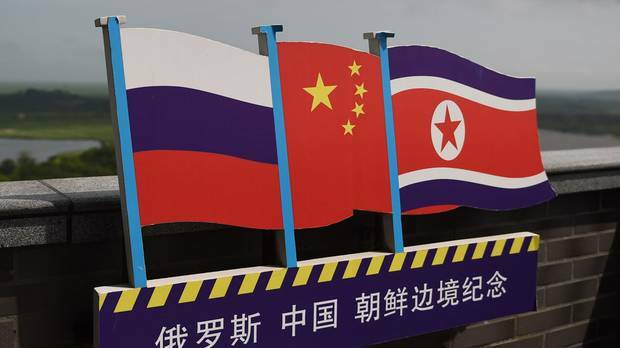 The border between nuclear neighbours: China and North Korea at the edge of patience With Kim Jong-un hell-bent on extending his nuclear reach, an angry and anxious China is getting fed up with its long-time ally – and preparing, it appears, to flex its strength, Nathan VanderKlippe reports. 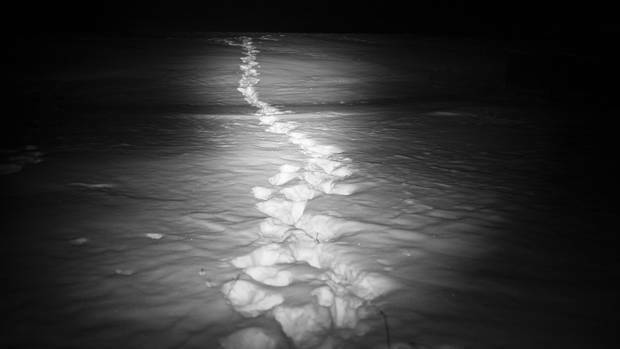 The Midwest Passage: Asylum seekers take a cold journey to Manitoba from Trump’s America Justin Giovannetti and photographer Ian Willms followed 22 asylum seekers who crossed the U.S. border into Canada near the town of Emerson, Man. They are part of a growing tide who are risking their lives to go north.